This is some heavy stuff: the post proposes to use statistical results from computations on cycles to develop, in turns, the broad aggregates and expand the level of details; we move from 56 years to 224 quarters (1 years = 4 quarters). 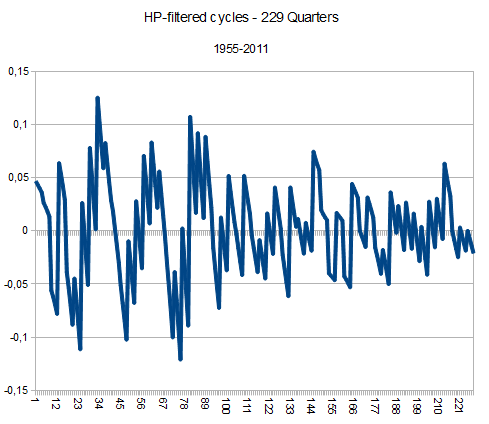 Obviously, this gainsaid much of the computations performed in other posts: the HP filter does usually a lot better with quarterly data, and these do not come in hand – not so much a gainsay as it is a complete reformulation of any past doodling. On the other hand, the closer any official study got to it was the Finance Ministry’s 2009 study on Cycles, considered too short a time sequence – 1980 to 2008. This will explain some discrepancies in their results – it also explains why the Hodrick-Prescott filter works better, although I suspect any non-parametric filter would do equally fine. Annual GDP is usually computed as follows: (adjusted for seasonal fluctuations). On the other hand, we might substitute this expression with a more probabilistic setting, with the cumulative density for quarterly GDP (with a normalized annual GDP to 1) this statistical device is needed to generate the moments needed for further computations: mean, standard deviation and perhaps skewness. Obviously, this denies the modelthe possibility of capturing outstanding fluctuations, but there is an arbitrage to be made: scarce data, persistent fluctuations and the easy in computations. Persistent fluctuations: to capture these means eliminating outliers; no doubt the process will underestimate negative shocks because of the constraints put on the model. Handiness in computations: there are some models available, for which assumptions -sometimes strong ones- have to be made in order to make sense of it all. In that respect, the results are not supposed to be iron-cast; in uncharted territories, it is hardly the case, and Moroccan business cycles certainly are. From the beginning of the year till its end, growth is somehow randomly distributed across quarters. Perhaps ‘random’ is not the right word: what matters here are the moments of interest; it matters little to ‘guess’ the appropriate form quarterly growth displays over the very long run, and these errors will cancel out over almost 230 quarters. the initial step is to adopt the overly simplistic assumption that growth is uniform across quarter, that is, growth adopts the cumulative density of a uniform distribution, from Q1 to Q4, while the assumption is indeed very strong, it has the convenience to present us with smoothness: uniformity means inter-quarter growth will be very close to the yearly trend growth. In that sense, those recorded disturbances around the trend will be considered as the historical volatility we need to compute for more advanced distributions. As one can see, the quarterly data does not distort the original series too much, the trade-off being at the cost of a marginally smaller volatility and average GDP. 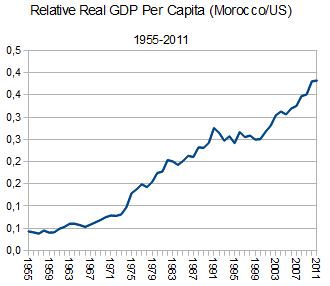 Brand new Morocco’s Quarterly RBC, and HP-filtered. The newly generated doesn’t look much like the earlier results I posted on. Simply put, the data was not fit for cycle-generation. Some short-term fluctuations were not taken into account precisely because the data was annual, and subsequently, some outstanding quarters (in both ways) were skipped or instead exacerbated because of their effects on annual growth. Overall, the essential features of ‘yearly’ cycles can be found in the graph too: boom-and-bust in the second half of the 1960s, the boom of the 1970s, and then the quagmires in short cycles in the 1980s and 1990s. How does this cycle perform with respect to that computed by the Finances Ministry in their 2009 paper? Les huit cycles d’affaires enregistrés durant les décennies 80 et 90 ont été marqués par la comptabilisation de 13 années de sécheresse entrainant de fortes oscillations de la production agricole et des secteurs de l’activité économique qui lui sont associés à l’amont et à l’aval. 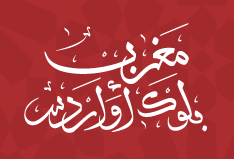 […] La phase expansionniste que connait aujourd’hui l’économie marocaine se démarque clairement de l’expérience des décennies précédentes […] Ce contexte d’évolution démontre distinctement dans quelle mesure l’économie nationale a réussi à amorcer un changement positif de structures économiques et à développer une grande capacité d’adaptation et d’amortissement des chocs. Les gains de stabilité et de durabilité enregistrés au cours de ces dernières années tiennent dans une grande partie à l’amélioration de la conduite de la politique économique et de la qualité des dispositifs institutionnels. The findings about the expansionary cycle beginning from late 2000 are somewhat mitigated when one considers a longer time series: true, the average cycle has been less volatile (25% less than the 229 quarters-long time series) but these fluctuations are under-estimated in the MINEFI study because of the historical volatility they embed: the 1980s have been very volatile indeed, and the great moderation that followed makes cycles in the 2000s very moderate, hence the optimistic view held in the ministry’s findings. On the other hand, it seems the last 40 quarters have exhibited historically low volatility, which, when combined with those in the period 1980-2000, can be under-stated. 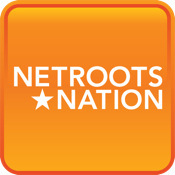 From Hero to Zero: 7% – 5.5% – 5% … 4%? Who cares really… Forecast in growth is usually a very tricky business, but it is interesting in assessing the government’s own projections of how the Moroccan economy will fare in the next couple of years. the lower the initial value, the higher the next growth figures will have to make up for it – that’s how averages work. 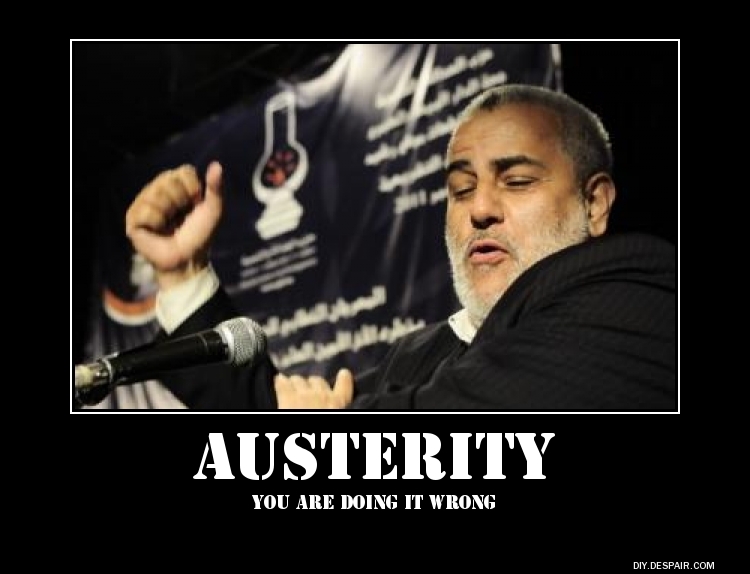 But then again, I do not expect the government to delve into explaining the method by which they get their figures. So if the Moroccan economy does not perform very close to 5 or 5.5% every year, then they would lose their bet, and with it some of their spending commitment will be halved or shelved. But since no such data exist for Morocco, I had to make do with the available material, and settle for the standard 2080 hours per productive worker. * Investment dynamics: the definition combines a measure of domestic savings and inflows of Capital. * National Accounting Identity: government expenditure factors in foreign shocks as well, so as to capture other constraints a government in a closed economy doesn’t usually face. the assumption behind a utilitarian rate of substitution precludes any activist policy; the idea is to figure out first how an optimal funding for government expenditure in an RBC setting, then consider other settings where taxes are selected according to a specific decision rule. the model is significantly less volatile than the data, but ultimately fields good prediction when the cycle is close to the trend. (we can already say the tax sequence is not based on utilitarian principles, since volatility on is higher than total government expenditure, and a lot closer to that of empirical government aggregates – this means taxes on capital are either too distortionary, or that government decision rules are based on unknown parameters. 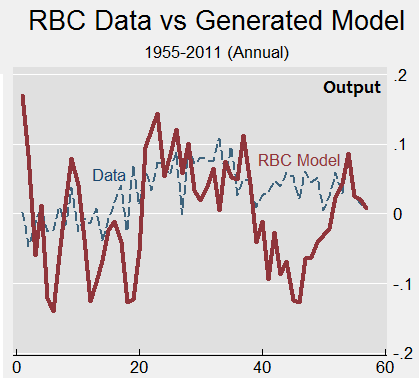 in terms of cycle projection, while issues of equity premium puzzle arise – the comparison between RBC-generated data and empirical cycles for investment and capital, broader results are in line with model predictions, in particular when the cycle is close to the trend; aside from the expected low volatility, deviations are mainly due to exogeneous shocks, which allows for some predictions without too much tampering with the broad aggregates’ identities. At this point, the model predicts very narrow results for the next quarters in 2011, but it remains very ellusive: the graph below points out to the variations with respect to the potential GDP growth per capita – about 3,94%, or 4,98% in aggregates terms. Growth will not go beyond 5% for the next half a decade; there are no particular exogeneous shocks to expect that might lift productivity up and thus push the boundary of potential growth. There are however many shocks to expect that might slow down growth: foreign demand for Moroccan exports is likely to weaken, and the need for imported goods – whose relative price is quite high- will grow and handicap the economy. This means growth projects are wider on the lower side than they are on the upper one; a growth target for 5%, the baseline scenario might very well look overly optimistic, let alone an average of 5.5% over the 2012-2016 period. This sector plays a substantial role in the macroeconomic balance of the country. The quintessential argument behind any serious rationalization over quantitative predictions on the Moroccan economy has been the importance of agricultural output. While it is clear that particular sector is of vital interest to the Moroccan people and businesses, I would like to submit some pieces of evidence that challenge the conventional wisdom surrounding it. Because only too often do our government officials, elected and otherwise, get away with their failure to create the right conditions for growth and job creation by hiding behind the Agriculture Smoke-screen. My criticism doesn’t apply to a particular government, it is merely an observation. 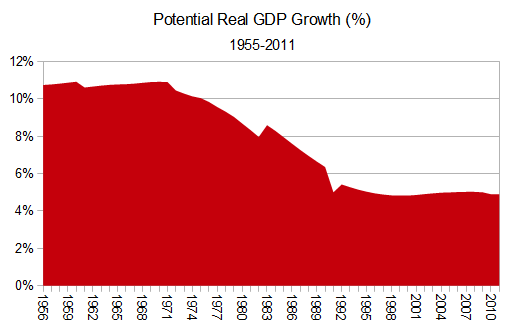 First off, Agriculture as a percentage of GDP is decreasing at a steady pace since independence. I took the liberty to generate the missing decade from the World Bank Data and then retrofit it back into the PWT dataset; since 1955, while Agricultural GDP grew 4.31% on average (in real terms per capita) its share of total GDP fell a modest – 0.17% on annual average over the period, decreasing from 23.7% in 1955, to 13.84% in 2011. We are interested in looking into the effect of agricultural output on the aggregate business cycles: if indeed correlation was strong, as strong as, say that of domestic consumption, then the official line holds: agriculture matters, it influences Morocco’s economic performance, and has to be taken care of. However flawed the tax exemption is, it would make sense as a policy in broad principle: a tax-pristine economic sector doesn’t usually experience fiscally induced distortions, and the main thing our agricultural sector would benefit from is a smoothing of an all-too volatile cycle. On the other hand, if the agricultural output doesn’t exhibit strong correlation indicators with GDP and the other significant aggregates, then we can say with a great deal of certainty that agriculture, while retaining its importance for a significant part of Morocco’s labour force, does not hold sway over Morocco’s economic performances, and as such makes it even harder to justify some policies and plans for that particular sector. When the agriculture sector is in trouble, so is total GDP (hence the positive coefficient of correlation) but one can notice the virtual symmetry in their dynamics – as though the effects of agricultural fluctuations are ‘locked’ into a tunnel: however agriculture fares, the projected fluctuations conditioned by its state on GDP are located between – 4.2% and + 4.3% deviation from steady state, which is still less volatile than the total aggregate itself. In fact, the correlation in cycles is weak whenever agricultural GDP is in recession: .29 vs .414 when it is expansionary. the symmetry doesn’t carry beyond cycle statistics, which confirms the initial assumption agriculture is not a drag on the aggregate economy. 1/ Agricultural output is more volatile than GDP – respectively .113 and .0785 (in standard deviation). 2/ AGDP and GDP are more correlated in periods of expansionary cycles than they are in times of recession. 3/ GDP is more volatile when AGDP is in recession, but the average recession has a smaller magnitude and volatility compared to the broader aggregate. This should be the last of “the Big Picture” series. My computations have reached a point where further effort needs to be fed more reliable figures – and get paid handsomely for it. All previous results assumed no government intervention in the economy; But just as the initial results did not factor in foreign trade, the gradual adjustment of the RBC model shows our laborious business cycles accounting gets better as we introduce new elements. where Consumption, Investment and General government expenditure make up GDP. Government wedges do a very good work actually: the distortionary effects of labour taxes for instance, account for much of their deviation from steady-state and correlation with output. Same goes for Capital, but not investment: while corporations are taxed on their operational margins -minus a few policy incentives- they do not seem to have a significant impact on their investment decision. the model’s shortcomings are relatively easy to explain: the only exogeneous shock incorporated in the model comes from foreign trade (trade balance) and model specification restraints somewhat capital accumulation; this explains why capital is more correlated to output in the model compared to actual data: other (significant) factors have not been taken into account. While government wedges do quite well in explaining absolute and relative volatility (to output), they are pretty weak at explaining the intrinsic volatility of government expenditure, nor do they succeed in capturing the pro-cyclical nature of empirical public finances; the RBC model matches the theoretical framework of government expenditure – anti-cyclical and designed to smooth business cycles over- actual data however, seem to indicate a relatively weak positive correlation between government expenditure and Morocco’s business cycles. One way to account for this result is the strong assumption underlying government expenditure and tax receipts: these are set to be balanced over the long run; this means public debt as a budget policy designed to fund some of the government’s expenditure in smoothing cycles – especially in recession phases- is not as efficient as one might think – efficiency, in this case, is not to be measured for the quarters following the immediate expansionary policy, but as a result taken over a long period of time, such as the one the data is based on. There was one major difficulty I kept stumbling upon: no matter how careful my coding was, I failed to produce satisfactory results as to the differentiated impulse responses triggered by exogeneous shocks, those “white noises” from the structural shocks and functions. Other than that, the final results are pretty straightforward in view of the described methodology. \\simulated shocks from exogeneous "white noises"
and that is so because the empirical data shows it: the long-run shows both the Balance of payments and the Solow Residuals converge to a zero. 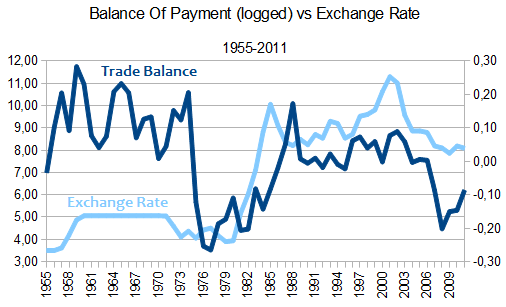 Balance of Payments and the Exchange Rate exhibit a strong positive correlation, starting from the mid 1970s.